In the life of every cook comes the day you get tired of thin-bottomed, burn-and-toss cookware. Cuisinart is a popular manufacturer to buy from and we've typically had a good experience with them. In this review we will break down the Cuisinart MCP-12N Multiclad Pro stainless steel cookware set to see if it provides a better cooking experience and help you determine if this set a worthy purchase. The MCP-12N is made in China. 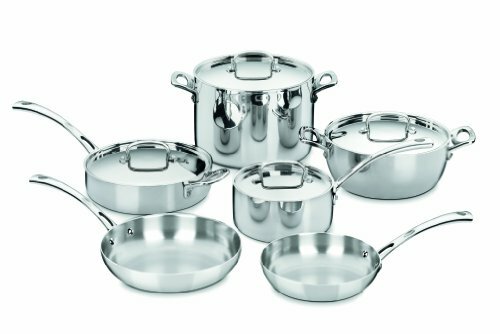 This stainless steel set offers a brushed finish on the exterior with a mirror finish on the inside for great release as foods cook. These pots are built with an aluminum core between the two layers of stainless. On gas and electric cooktops, the aluminum transmits heat exceptionally well. On induction cooktops, the magnetic stainless offers the right amount of resistance and will heat quickly. The MCP-12 Or Cuisinart FCT-10? The FCT-10 cookware set is made in France. This stainless steel set features a polished stainless finish on both the exterior and the interior of the pot. These pots are more rounded than the MCP-12N, but both offer the critical interior core of aluminum for excellent heat transference and the magnetic stainless so critical for induction cookware. The edges of each of the pans are tapered for easy pouring and to guarantee a good seal between pan and lid. Seen enough? Check out the Cuisinart Multiclad Pro on Amazon. These are ideal for cooking items that don't require steaming or stewing, including meats such as hamburger or chicken and dishes such as low mein or chow mein. Please note that one of the lids included for another part may well fit your skillet, but they're not designed to provide a complete heat seal. Your Cuisinart Multiclad Pro skillet is designed to cook in the open air. Sauce pans are an excellent choice for boiling or stewing. The tapered edges make pouring out of these pans easy and dripless. The lids are designed to seat down into the pot, providing a great seal and reducing spatter and spills. This sauté pan would be a great starting place for casseroles or a small stew. The helper handle opposite the long handle makes it easy to transport this pot, which will be quite heavy once full, from stovetop to oven. Don't overfill! Leave space for the lid to seat down into the pot; you'll get a great seal and an excellent finish to your casserole. Your stock pot will be an ideal container for soups, stocks or your steamer insert. The wide flared handles will make it easier to use this piece, but always transfer with care. A full stock pot will be extremely heavy, and the sides of this pot will be as hot as the bottom. With this steamer insert, the sky's the limit. You can prepare and easily drain pasta, layer the steamer and make steamed vegetables, reheat tamales or seafood in this steamer insert. The wide, flat steamer surface makes an ideal spot for lobster tail as well. Stainless steel, even magnet sensitive stained steel, is a poor conductor of heat. Cuisinart's choice to wrap two layers of stainless steel around a core of aluminum gives these pans the best of both worlds. The aluminum core serves as an excellent heat conductor, spreading heat across the bottom and sides of the pans. It should be pointed out that copper conducts heat even more effectively than aluminum. However, while copper is often used in the bases of stainless steel cookware, its wrapping capabilities are limited. For best flexibility and a pot or pan that conducts heat across the bottom and up the sides, aluminum is a far superior metal. As seen in our stainless steel cookware reviews, the stainless steel exterior shell provides durability and a stable base for the aluminum, while the stainless steel interior keeps a non-reactive surface between the hot aluminum and your food. Each of these pieces can go into the oven and will tolerate up to 550 degrees Fahrenheit / 288 degrees Celsius. Please note that the stainless steel construction of the handles will prevent heat build-up on the cooktop; once that pan and lid go in a hot oven, everything will rapidly become too hot to handle. Treat any part of a stainless steel pan in a hot oven as a hazard and handle with care! The handles and lids of the MCP-12N set are constructed solely of stainless steel. On the stove, this keeps them cooler than the pots and lessens your risk of burns. Each handle on the pans is riveted onto the pot for durability and long life. These lids are flat and seat down into the pots for an excellent seal and effective heat capture. The pan lids offer a tall, squared off handle, and each handle is basically the same size. It must be said that the smallest saucepan lid looks a bit out of balance, thanks to that large handle. However, if you've ever tried to force your fingers through a hot lid with little clearance, you'll be very thankful for this flared lid handle. The exterior of the MCP-12N are all brushed stainless steel. These pots are unlikely to show water spots or soap residue build-up, and if you do get a burn on the outside of the pan. You can scrub it away with a fine pumice cleanser such as Barkeeper's Friend (best stainless steel cleaner) without damaging the finish. This exterior finish isn't as striking as a mirror finish, but it's easy to clean. The interior finish of all of these pans and lids is mirror polished. This leaves no striations or "brush" texture in which food will get captured, burn and discolor the cooking surface. While these pans are not nonstick, they offer an even distribution of heat and will require only a little fat or liquidity to keep your food from sticking. Per Cuisinart, the lids of the MCP-12N set are dishwasher approved. Many users go ahead and wash the pans in the dishwasher as well, but it's not recommended. Dishwashers are hot, humid spaces. While stainless is inherently corrosion resistant, humidity can lead to corrosion. 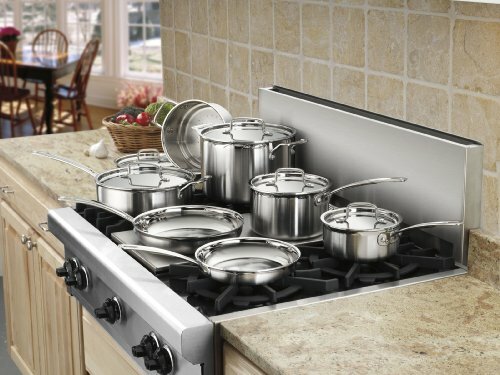 Addition, any acidic food left on the pan may lead to discoloration and your stainless steel pans will be much better served by handwashing than by putting them in the dishwasher, particularly if you want to hang them with one of the many cookware organizers available on the market. See our best dishwasher reviews for details on protecting your cookware in the dishwasher. Properly handled, these pans should last for years. As we age we lose a bit of dexterity, but luckily these lid handles give us plenty of room to grab. While these pans aren't as good at heat conduction as a cast iron pan would be, they are not as heavy and will not wear on your joints. There's a rivet plate on the outside of each of the pans where the handle joins the pot. This is the best reason never to put these in the dishwasher; this is a great place for moisture to collect and cause rust. These lids seat down into the pot. Do not overfill! There will be a learning curve to this, but you can save yourself a lot of mess and spills by leaving plenty of room. Stainless steel lids are hard to peek through; you'll have to take the lid off to see what's going on, and this releases a lot of heat. However, a tempered glass lid will only be oven safe to 450 degrees Fahrenheit / 232 degrees Celsius. The fundamental differences between the Cuisinart MCP-12N Multiclad Pro Stainless Steel and FCT-10 French Classic Tri Ply are small when considering daily use but quite large when thinking about cleanup and display options. Additionally, if you avoid Chinese made products in general, this will suit you better. 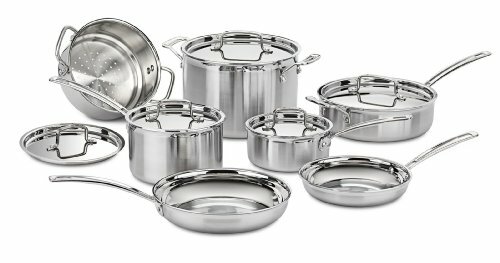 Where is Cuisinart cookware made? Many places, but this line is made in France. Users of Cuisinart Multiclad Pro cookware swear by this French produced line. Both sets will work on any cooktop; in this case at least, Cuisinart Stainless Cookware is Cuisinart Induction Cookware. This is not true of all stainless steel, nor can it be said of all Cuisinart cookware. You can test this easily by placing any magnet on your existing cookware. If the magnet sticks, you're all set! The FCT-10 French Classic Cuisinart Tri Ply Cookware also offers most of the same components available with the MCP-12N, except that you don't get a steamer. The edges are not rolled for drip protection, but that does make them easier to clean. Both sets offer triple layer construction with an aluminum core sandwiched between layers of stainless steel. The biggest difference between these two sets is the mirror finish on the outside. If you plan to hang your pots and really want them to sparkle, get the French Classic. Be prepared for some careful wiping to maintain that exterior shine. When properly cared for, these are gorgeous on display. The risks of even the best nonstick cookware have got many cooks thinking about going with something more stable, and Cuisinart pots and pans may be a great investment. The steamer basket may be a deal breaker for many so it's important to review your cooking preferences and invest in the set that will suit your needs. Did you enjoy this guide? Let us know in the comments with your thoughts and experiences with the Cuisinart MCP-12n Multiclad Pro and the Cuisinart brand.